While this is not my normal doodle fare, I still think it should count for my creative output for the day. I suppose I could scan in my scratchy notes while I was planning it, but they’re all a mess. 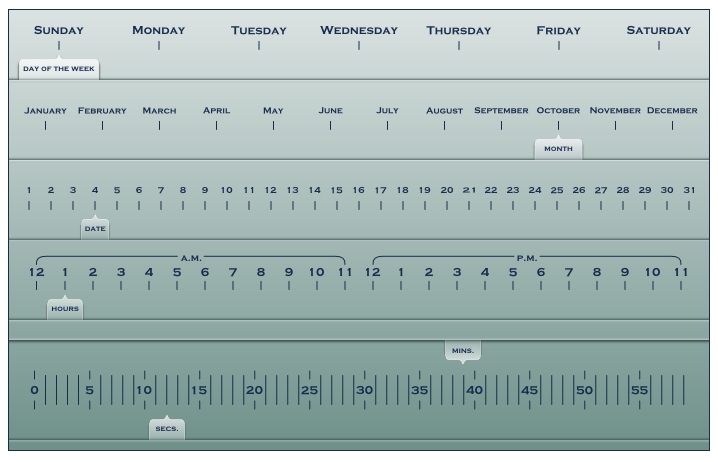 This is a html/jQuery clock I made that moves the slides along the scales based on the current date and time. The idea popped in my head some time ago, so I had to make it. This entry was posted on October 3, 2009 at 7:00 pm and is filed under Doodles, Web Stuff. You can follow any responses to this entry through the RSS 2.0 feed. You can leave a response, or trackback from your own site.